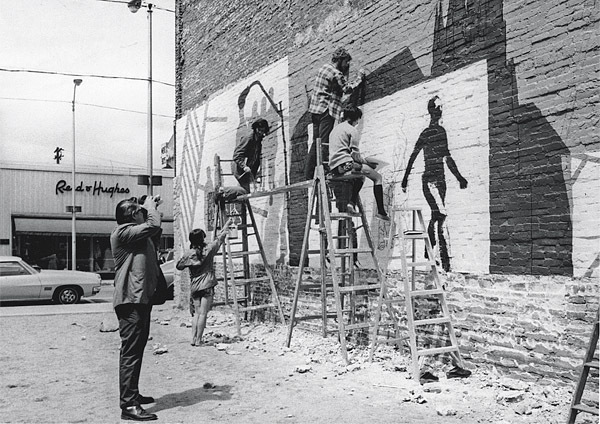 Students paint the Lisbon Street mural in 1971 as an unidentified man films the work. Donald Lent, Bates’ new Dana Professor of Art, was looking for a Short Term project that would connect students to his civic efforts around urban renewal in Lewiston. The city, wanting to open a new pedestrian walkway linking upper Lisbon Street and Park Street’s retail and parking areas, had demolished a wood-frame building next to Edward’s Clothing Store, at 114 Lisbon St. The store’s newly exposed brick wall caught Lent’s eye. Encouraged by the city’s Urban Renewal Authority, Lent got permission from the building’s owner to paint a mural on the wall, then selected 13 students from 30 who showed interest. Guided by Lent, the students developed sketches on butcher paper and painted the mural in white, blue, red, and a particularly tenacious traffic yellow. The mural’s narrative was straightforward: pedestrians moving through familiar Lewiston places. “I wanted the mural to connect to people in town,” Lent says. Silhouettes of downtown features included the onion domes of the Kora temple and the spires of the Basilica of St. Peter and St. Paul. Bates had just approved an art major, and Lent was no fool: He stocked the project mostly with freshmen eager to prove their artistic zeal. Those were heady times, says Jonathan Lowenberg ’74, who came to Bates to major in chemistry but switched to art partly because of the mural project. But one day a decade later, Lent saw workers sandblasting the mural. “That felt awful,” he says. Lisbon Street was losing its retail businesses, and the clothing store had closed, to be replaced by an Asian restaurant. Today, the wall belongs to an Indian restaurant. Tiny white and yellow paint chips from the mural still cling to the bricks. And if you stand back, you can still see the outline of one of the mural’s pedestrians, walking through the scene.